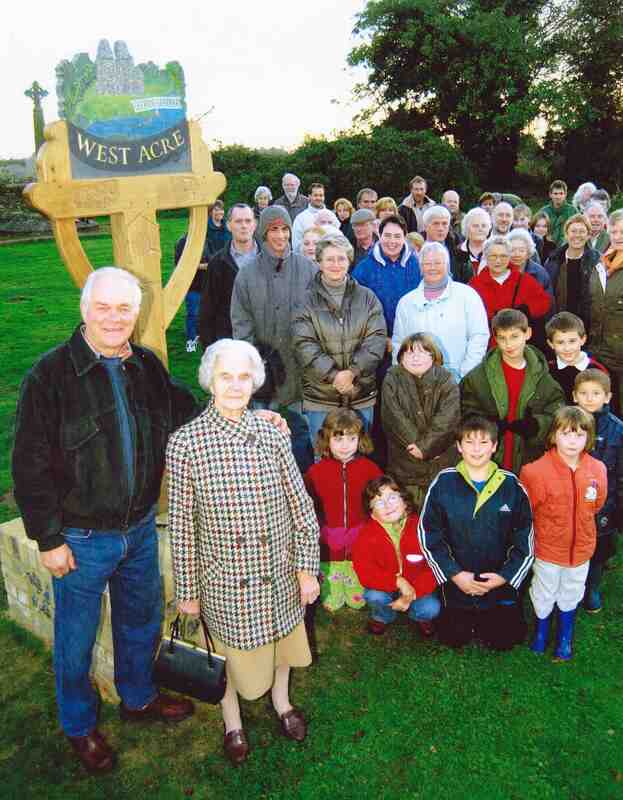 This page is dedicated to the memory of the people and places that have played their part in the making of West Acre. If you would like to suggest someone, or some place, for inclusion please contact Ralph on the Contact a Councillor page. Jimmy was born in 1889 and lived all his life in Westacre - except for service in the First World War. On leaving school, Jimmy went to work on the farm before spending most of his working life in the woods. He spent many years working with horses. In the First World War, he spent time in Salonica (Thessaloniki) and was at Gallipoli, still working with horses. After the war, Jimmy settled with his wife and children. He worked in the woods and driving the game cart (pictured right). His son Roger lived in King's Lynn and was in regular contact with Colin Deasley, who worked with Jimmy on leaving school. Jimmy died in 1967. His grave is in the churchyard. Jimmy's son, Roger, died in 2016. Beryl was born in 1906 in Stag Cottage next to the pub, but soon afterwards her family moved to one half of what is now Ford Cottage – just across the road. Her parents, Walter and Alice Wilson, had come to West Acre where her father looked after horses and other livestock on the farm. When she was still at school she trained in the art of making doll’s house furniture at High House with Mrs Ysabel Birkbeck. Her first proper job, having left school, was serving at the Stag Pub. In those days it was an “off–licence” where people had to bring their glasses for her to fill from the cellar & then she would pass them back through the top of the stable door. Next she went to work at the (recently built) Vicarage, helping to look after the Vicar’s 5 children, and eventually ended up working at Abbey House where she met her future husband Hubert, the chauffeur there. In 1930 they got married and moved into the cottage at Home Farm where she lived until her death in 2007, surviving Hubert by 10 years. They were devoted to each other, and were married for 67 years until his death in 1997. One of the things she used to love when younger was riding pillion to him on the motorbikes they had. They would go to Norwich and Yarmouth and often well out of Norfolk. She also loved the trips they made together to Kinloch Hourn in Scotland while working for the Birkbecks on holiday there. She and Hubert would drive up together in a Landrover, taking all necessary provisions required for such a remote place, and she especially enjoyed the two or three-day journeys with him, staying at B&Bs in all sorts of places over the 25 years that they went. In the 1930’s Beryl became one of the key workers in the Doll’s House Furniture business, where they made exquisite miniature reproduction furniture for sale in cities all over the country. When Mrs Birkbeck died in 1934 she was asked if she would take on the business, but she declined and the enterprise came to an end. During the Second World War she worked on the land on the Estate, and she was also a member of the local Red Cross, obtaining 5 certificates for services during the war effort. Beryl was a great supporter and one of the founding members of the West Acre Women’s Institute, where she also demonstrated how to make the tiny furniture for the doll’s houses. She never had any children of her own, but was a marvellous carer for her neighbours’ children whenever needed, and was especially devoted to Ruth and Broom Chase and all their family. She was always busy, whether it was breeding rabbits, or making dresses or curtains or loose covers. She kept the most beautiful garden, got to know and care for all the birds that visited, and created a really lovely home that welcomed so many people over the years. She read the papers and listened to the radio and television (she and Hubert had one each in different rooms for when they wanted to watch different programmes) and was always well informed of the world around her. At the millennium, aged 96, she unveiled our new village sign in front of what must have been the largest crowd of West Acre people and their friends that has ever gathered together, and she stood robustly before everyone, delighted to have been given the honour! Beryl showed how brave she could be when, in her 100th year she got cancer for the second time, having recovered from it when she was 34. At first she wasn’t going to tell anyone, but having been persuaded to get help, she calmly underwent the operation and uncomplainingly put up with the chemotherapy. A little later, when she broke her hip, she silently put up with enormous pain when being “helped” up off the ground before anyone realised she might have broken a bone. A few weeks before her 100th birthday she was asked if we could warn the Palace so that the Queen could write to her, but she had already done this herself! She was offered a party at Westacre High House which she readily accepted and to which she asked 96 people. With only four or five refusals, over 90 friends from 6 years old upwards were greeted by Beryl at the top of the huge staircase (with the Queen’s signed card beside her! ), before sitting down to dinner in the long gallery there and had a wonderful evening. When she died a year later, similar large numbers came to the funeral in the church to say their goodbye’s. She may be remembered most for being someone who lived to 101 and always in the same parish, but for those of us who knew her, she gave us many, many more things to remember her by. Her twinkling smile and her wonderful welcome being just two. Jonathan was born in Westacre in 1908 in one of the houses opposite the Stag Public House and was one of five children who were brought up by John and Susan Wilson, who lived in Westacre all their lives as had their parents before them. He started work when he was eight years of age going down to the Abbey where he cleaned boots and shoes, cleaned out fires and other similar tasks. These jobs were done before he went to the village school. At school he learned the basic skills of reading, writing and simple arithmetic. At that time there were up to 100 children on the register and they were taught by two teachers in the two roomed school. In his words his relationship with the teachers was not too positive. His first home was also adjacent to the blacksmith’s forge, which was worked by two brothers and together with other lads from the village he spent hours watching the horses being shod and wheels and implements being made or repaired. At times he was allowed to work the bellows and even take the horses back to the farms. Also in the village there was a butchers, where the boys liked to help make the sausages and when a pig was killed they were given the bladder to play football with. At that time there was also a small shop and a coalman who owned a small holding, where he collected the milk for the family. The family then moved into one of the houses opposite the Church and Jonathan left school when he was thirteen and went to work in the gardens at High House, where he learnt the trade which was to last him through his life. After a few years he left to work on the farm at Soigne. The family moved again this time to Pear Tree Cottage which was a half brick house attached to several thatched cottages in Middle Road. His parents were to stay there for the rest of their lives. In about 1928 he met and fell in love with Ivy Boughen who was working at Warren Farm and they were married two years later on November 5th. and were found a cottage to live in at Pretoria. He was still in love with gardening and got the job of gardener at Abbey House where he worked for Mr. Jelf doing a job he loved. They moved into the gardener’s cottage on River Road where in the next six years two children were to arrive, Grace and Jack. At about this time he had a trial for Norwich City Football Club and became a qualified Methodist local preacher. In the summer of 1939 with war looming, the army took over the Abbey and the cottage and built a small base on the adjoining land. This led to another move, this time to the cottage on Lynn Road next door to Harry Boughen and his wife and Major Birkbeck found him a job back at Soigne Farm. He was to work there throughout the war years, doing all the normal farming tasks and helping Charlie ‘Lop’ Andrews manage the sheep through the winter months, which meant sleeping out in the shepherd’s hut. During these years as well as working full time, he managed to look after a very large garden, two allotments, his father’s garden and lease a small field where he grew sugar beet and cereal crops. He also reared chickens and a pig which kept the family in eggs and meat. He was in the Home Guard and a Warden and continued as a Methodist local preacher cycling to all the villages in the Swaffham Circuit every Sunday. In 1944 a third child – Angela – was to arrive – the apple of his eye! ‘Reading Room’. The Reading Room had been provided by Major Birkbeck many years earlier as a place where villagers could go to read a book or play draughts and dominoes. supplemented by looking after about four private gardens. Ivy loved it but he never settled and after her untimely death in 1972, his first action was to contact Harry Birkbeck, who found him a cottage back at Pretoria where he had started his married life. A few years later he re-married and then moved to sheltered accommodation in Gayton, where he continued to do part time gardening for Henry Birkbeck and Leslie Cameron. He eventually finished work when he was in his early eighties but shortly afterwards had a stroke. He continued for a few years but eventually died at the age of eighty seven and is buried with his wife in Westacre Churchyard.Throughout his life Jonathan was a devoted Methodist and no one can ever recall him using any bad language and always looking for the best in everyone, and whilst working could always be relied on to be singing well-known hymns. Jonathan’s sister Eva remained in the village looking after the parents whilst the brothers took on various roles: Bertie went to London where he served about 30 years in the police; Charley became a horseman and went on to be farm foreman at Siogne and Harry, often seen as the black sheep of the family, became farm foreman at East Walton before becoming the tenant farmer at Summer End Farm. John was born in Westacre, lived his early years at High House Farm and grew up in the village with Peggy and Cyril and his sister Judith. Peggy, his mother, still lives in the village where she has lived almost all her life. She is 97. John lived in five houses in the village. He went to school at Westacre and then, after amalgamation, at East Walton. In those days there was no secondary school; Mrs Wilson and then Mrs Dye taught you until you left school. John, like almost everyone, left school and went to work on the farm. He cycled everywhere. He started playing cricket for the village at twelve. The team cycled to away matches. For a time the club packed up and John cycled to play for East Winch. He cycled to Swaffham to the cinema. He cycled to Narborough to catch the train to Lynn. He worked all week, until dinner time on Saturday, then cycled around for his leisure. John did his National Service like everyone else. Unlike most people, however, he managed to do it in Norfolk. From there he could come home at weekends. He bought a car. On a sports field, John was a good player and a fiery little bugger. Playing football for Castleacre, he knew where the ball was and he knew the shortest distance to it; sometimes the path lay through other people. His last game of football, however, came in the same week that his son Simon was born. His knee was done for good and throughout his life it intermittently collapsed. It would be unfair to Simon to say how long ago this was, but John has just had it seen to this year. With a knee replacement, perhaps he can start playing football again. John married (also Peggy) and they had Simon and Claire. For a few years they left the village and went to live in East Winch. Then they came back and ran the Stag for almost thirty years. It was the mainstay of village life. John also farmed the fields that went with the farm. Until retirement age he was out there every day. Their parties were legendary. fielding side or run his batting partner out. Like all Thaxtons, he could also hook like the devil. He was a very good close fielder except when his knee collapsed. He opened the batting, sometimes kept wicket and was famous throughout west Norfolk. His was the wicket they prized. More often than not they didn't get it. Look at the score sheet for the Massingham Cup final 1969. John won many a match for Westacre. The club packed up again and Simon went to play with John and Peggy's son in law Andrew at Hillington. Claire used to score with the most beautiful handwriting and accounts in the league. Grandsons Scott and Craig went to Hillington too. John retired from cricket but watches every week. 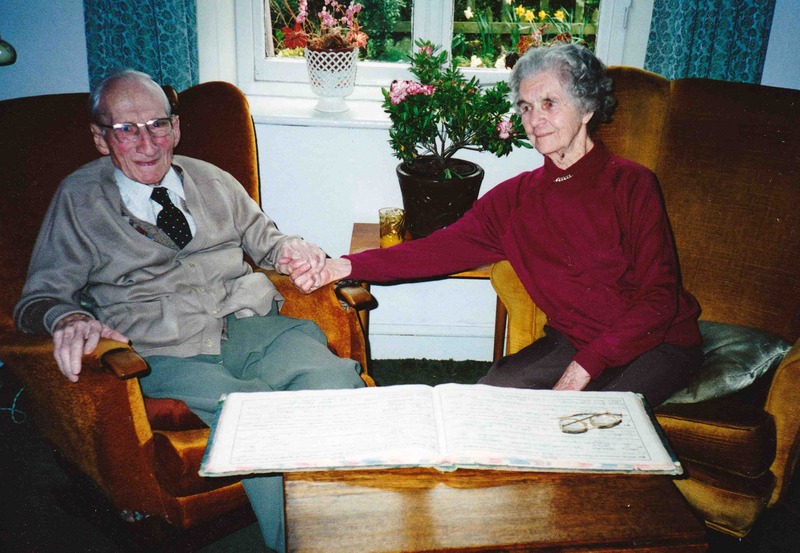 Thirteen years ago, John and Peggy retired from the Stag and moved to a bungalow in Gayton. They see their families (the other grandchildren are Lewis and Callum), they do their garden, they read and this year there will be no limits now that John has a new knee. There used to be Thaxtons at every turn on the Westacre estate. A quick count now includes John's aunt June, round the corner from his mother, and cousin Andy and family at Gayton Thorpe. We need more! Patrick was born on his family’s estate in Ayrshire on 21st November 1938. He had an elder brother and a sister, and at eight was sent by train with a travel label round his neck to West Downs School in Winchester. At 13 he went on to Winchester College where his great interest in history was kindled. In his last years at school his parents moved to County Mayo on the west coast of Ireland where he loved to go whenever he could get there. When he left Winchester in 1957, problems with his eyesight kept him from being accepted for National Service and, being too late to apply to university that year, he went to spend a year in Grenoble; no one remembers what he studied but it certainly wasn’t French! He then went to Nairobi in Kenya where his father had arranged for him to gain some business experience working for the Ford car agency, but selling cars did not inspire him and when his great friend Piers Thomson arrived, he quit work and set off in a rattle-trap car exploring southern Africa for three months. When he was twenty-two he came back to England and worked for a time in Yorkshire, and then, probably through his acquaintance with Harry Birkbeck’s sister who lived in Ayrshire, he came to Norfolk to discuss the potential of trout farming as a replacement for the watercress business there which had become uncommercial. In 1964 he went into partnership with Harry Birkbeck and became totally committed to setting up and developing the Trout Farm – one of the very first in the UK. An enthusiastic fisherman himself he had an easy affinity with fishing clubs which were his main market. He put in long hours and worked tirelessly and as a result the farm flourished and expanded. In October 1966 he married Fiona, Harry Birkbeck’s oldest daughter, and had three children Helen, William and Sandy during their marriage which lasted until 1978.
indomitable on a bicycle, often cycling in winter, impervious to cold or driving rain, and always dressed in tweeds and a flat cap. He was frequently seen cycling through West Acre or on his way to go shopping in Swaffham. sometimes two of his friends. He bicycled solo in New Zealand, and with visitor groups in India, Lagos and Cuba. His last bicycling tour was in Belgium with his eldest son, though it was cut short as a result of pain he was suffering. These bicycling trips were predominately with old male friends, but over the years he formed lasting friendships with several women of great kindness and character. Patrick’s concern for his local community rose from a strong social conscience as well as from his Christian faith; he regularly attended the Church in West Acre and was Church Warden and Secretary of the PCC for many years. He also helped maintain the churchyard, was a Trustee and a Secretary of the West Acre Village Hall Committee, a stalwart of the Parish Council, and a JP at the West Norfolk Bench from 1986. In 1990 he joined the St John’s Ambulance as Commissioner for West Norfolk. Qualifying as a First Aider he frequently went on first aid duties before resigning in 1996 only to re-join in 2003 to assist with fund raising. When he was young he learned to fly, and there were times in his life that he hunted, both with the Galway Blazers in Ireland and the West Norfolk Foxhounds. Later on he frequently joined Norfolk shooting parties. He was also a keen golfer, and in recent years played regularly right up until his last illness. In October Patrick had a mild stroke and, following various complications, he died on 24th October peacefully with his three children at his bedside. On the 10th November he was buried in West Acre next to his second wife Teresa, following which a service of Thanksgiving was held at Castle Acre attended by well over 200 people who had come to say goodbye to a man who lived life to the full and lived it with it great generosity and a big heart. As he said to one of his children recently “you get out of life what you put in”; he certainly put a lot in. Brian Wright seems to have led at least four lives. Except when her majesty took him away (to the army) they have all been based in Westacre. He was born at the top of the village in Ladle's House, named after Jimmy Ladle, once the village butcher. The house, like thirty others in the village, is no longer here. Brian grew up with his parents Billy and Beatie (Beatrice) and older brother Reggie. Billy had been one of seven children born at the mill, where his own father worked. Beatie was born in a cottage by the village green. Brian had all his schooling at Westacre except for the last year when he was sent to college - in Castleacre. He left school at 15 and committed the cardinal sin: he did not work on the farm or estate. Disapproval was bluntly expressed; but actually no-one could stop him. He went to a five year apprenticeship in joinery with Staines the builders in Swaffham. To get to school in Castleacre Brian and the other Westacre children (Derek Curl and Peter Welham) were loaned bicycles by the authorities. They discovered they liked cycling and used to race in village cycle speedway teams. Brian went further. Racing for Necton Swifts, he got to the Norfolk final at the speedway track in Norwich where they lost to Earlham Eagles. Then he spent eight years at Lynn cycling club. How did he keep up his training while working full time? On Friday nights after work he cycled to Potters Bar (98 miles), where he had relatives; then on Sunday he cycled back again. He competed for Lynn all over East Anglia and won many prizes (no cash in those amateur days). He held the Lynn 10 mile record, was track champion in Coronation year (1953), won everything up to 5 miles and rode fast times all the way up to 25 miles. He still sees old team mates at reunions. There is one sombre aspect of Brian's youth. From Westacre and nearby, six young men were in the army at Tobruk during the Second World War. Bill and Bob Thaxton, Cyril Goose, Bernie Coe, George Cox and Brian's older brother Reggie. Five of these were taken prisoner. Reggie was killed in action. there came when a forest fire, caused by their own shelling, killed 25 soldiers including Brian's close friend. Brian is one of a group of four who have represented the regiment at the unveiling of memorials in Cyprus and at the National Memorial Arboretum in Staffordshire. Brian returned home in October 1956 and built a bungalow with his father on Low Rd (now replaced). However, he never lived there because in January 1957 he married June Thaxton. They have lived in the same house for the last sixty years. For the next eight years Brian worked for Staines, where he was in charge of the joinery shop and earning 3 shillings and 6 pence (17.5p) per hour. Then he was offered work with a firm in London who were shortly to move to Lynn; and they paid him 7 shillings and 6 pence per hour! He went briefly to London. When he returned after one stint of a fortnight's work with a lot of overtime, June asked him if he had managed to save any money. He gave her £100! This was a colossal amount of money. The new firm closed down after 12 years and, after a year elsewhere as a joiner, Brian went independent, with a business partner, forming Country Kitchens. This was a well known and respected business which he worked in for another twelve years. Finally he returned to joinery for the last dozen years of his working life. Everyone knows another aspect of Brian's life, both professional and as a leisure activity. He is a highly skilled and vastly experienced wood turner. There must be a thousand households who have his beautiful work indoors and there are many people who have learned from his training or advice. He shows at craft fairs at Sandringham and elsewhere. Examples of his work can be seen in the church and on the village sign. Now is the time to buy some! Brian also has a strong sense of civic duty, does work for the village and is a font of local knowledge. He and June have both lived here all their lives except for her majesty calling him away. There isn't much they don't know. June and Brian have two children. They are not far away: Tim in Grimston and Deborah in Gaywood. There is also grandson Jamie, 6. Brian probably knows more about the village's history than anyone. Ask him.